Si-Plan Electronics Research Ltd offers a strain gauging service both for new uses and re-application to an existing sensor. 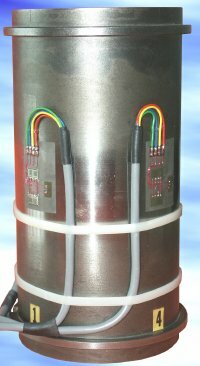 We can also design and manufacture load cells to fit special applications, and supply signal conditioning for transducers if required. The strain gauges in this example have been applied to a proving device for a block compression machine (BS 1881) The 4 strain gauges are used to ensure that force is applied evenly across the machine platen.